When Mom Has Alzheimer's, A Stranger Comes For Christmas : Shots - Health News The holidays can be difficult for families dealing with Alzheimer's, especially if the person with the disease is the one who used to be the heart and soul of Christmas. Helen Downs looks through some of her old recipes with her daughter-in-law Mary Downs. Helen used to be a big baker, but now Mary does most of the cooking. On the northern Virginia farm where Helen Downs spent her childhood, Christmas meant a freshly butchered hog and an epic family meal. When she had her own children, Helen brought this spirit of abundance to their home. 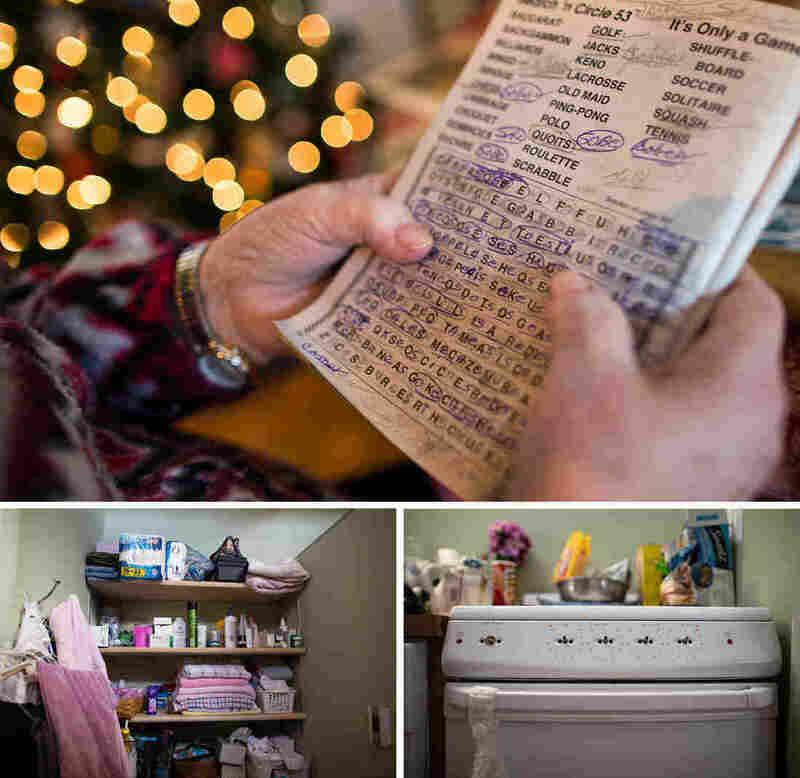 "When I think about Christmas growing up," her son Terry says, "I remember my mom cooking in the kitchen for hours." There was turkey and glazed ham, two kinds of stuffing, buttery yeast rolls flecked with cinnamon and pies: chocolate, lemon and cherry. She made it all, and she made sure everybody got a present. 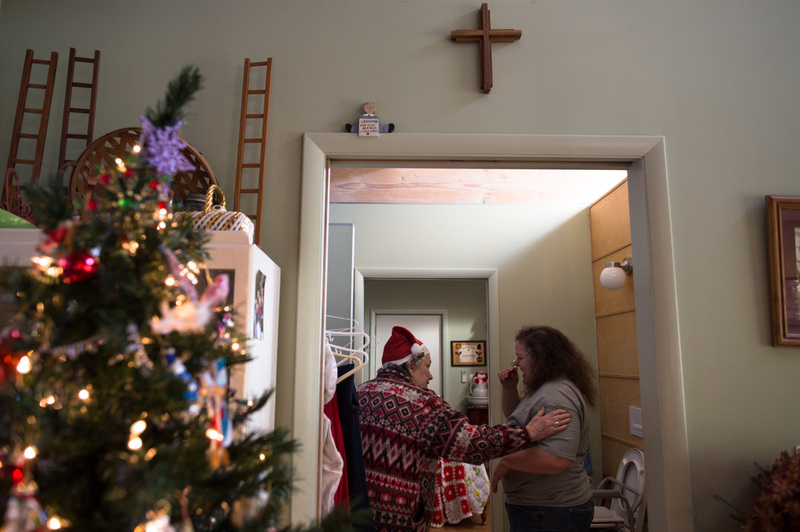 For the Downs family, Helen was the heart of Christmas. 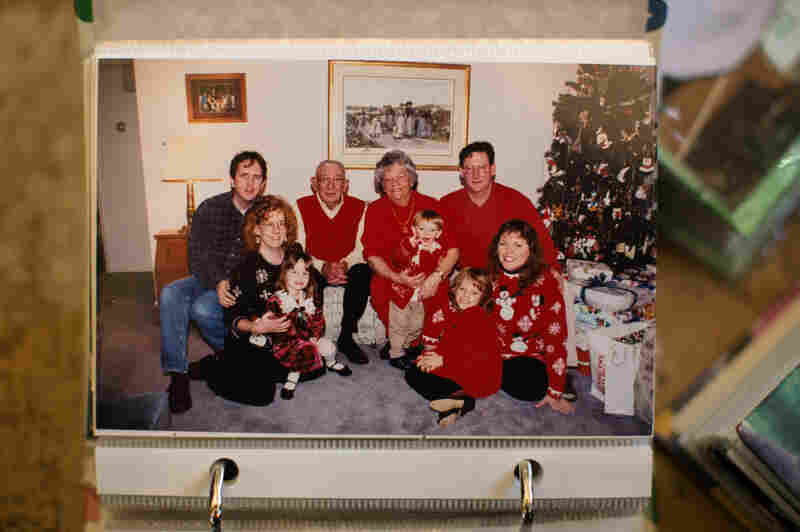 Helen and her late husband, Raymond, pose with the family in 1997. Christmas was a big event then, with matching outfits, stacks of presents and lots of food. Then Helen was diagnosed with Alzheimer's disease and moved in with her son. As she slowly forgot how to make her famous yeast rolls and use her microwave, her daughter-in-law Mary helped her send out greeting cards, buy presents and bake loaves of banana bread for everyone at Helen's day care center. She took on the Christmas dinner, too. 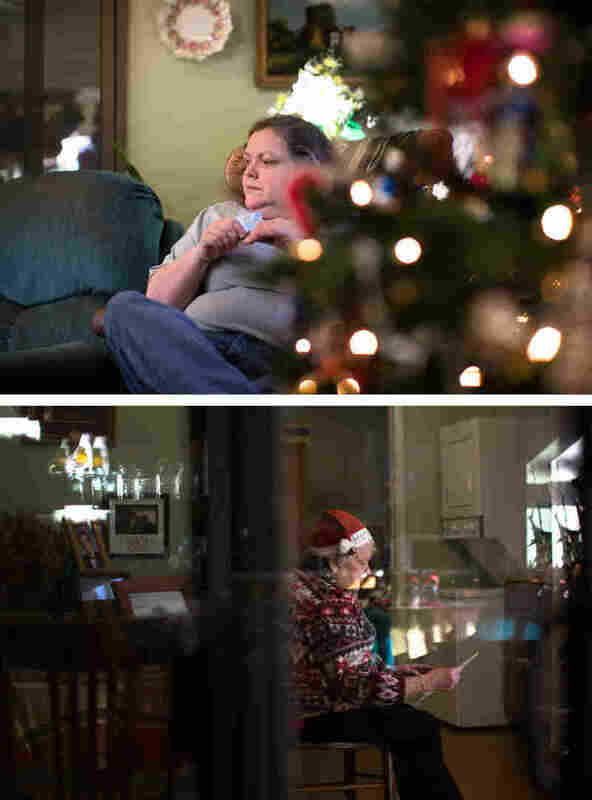 Caring for Helen as her mind deteriorates has never been easy for Terry and Mary, but the holidays make things harder. They have to strategize about how to celebrate without disrupting Helen's routine. They struggle with how to prepare relatives for Helen's inevitably worse condition and brace for the anger and disappointment they've come to expect when fewer friends turn up every Christmas. Mary and Terry Downs built an apartment onto their home for Helen seven years ago, so she could live there safely with Alzheimer's. Some 5 million Americans have Alzheimer's, and more than 13 million family members care for them. 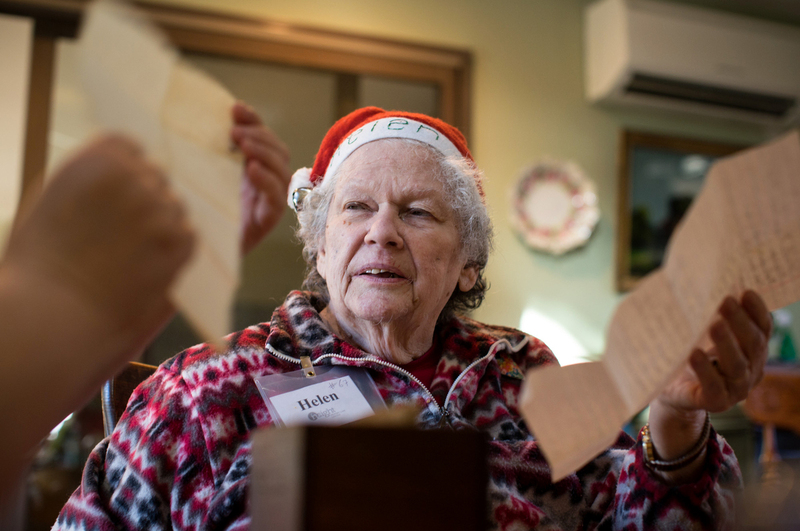 "There are families in every town, in every state across the country that are dealing with the realities of Alzheimer's disease at this holiday season," says Ruth Drew, who runs the national phone helpline for the Alzheimer's Association. Caregiving is plenty trying without the emotional freight holidays carry, Drew says, and the expectations surrounding a family celebration can make the season feel overwhelming. At this time of year, calls to the helpline become more urgent. "If you're calling a helpline on Christmas Eve, you're calling because you really need help." Things have changed in the seven years since Helen moved in with Terry, 54, and Mary, 53. She's still charming at age 86, with her Southern warmth and cap of silver curls, but her condition is taking its toll on everyone. "We're tired," Terry says. "We're just trying to get through Christmas now." As Helen has declined, the Downses have had to accept a new reality. "For me the hard part is that my mother-in-law is still with us physically, but mentally she's not there," Mary says. "It's almost like having somebody that's a stranger at Christmas." Helen sorts through family photos. She often talks about life on the farm in Virginia where she grew up. "We can't make everybody's Christmas anymore," Mary says. "To try to pretend that the losses aren't happening doesn't do anybody any good. It doesn't help your family members understand what's happening." Being open with family is important, says Drew. As ever more Americans are diagnosed with the disease — the association estimates some 14 million cases by 2050 — understanding how to navigate difficult holiday situations will only become more important. Emailing or calling relatives ahead of time to brief them on what to expect and how best to support the person with Alzheimer's can help, Drew says. Smaller gatherings can make things easier for caregivers and those with Alzheimer's. Noisy events and big groups can be overwhelming, so Drew suggests preparing the ailing relative by talking about holidays ahead of time, and looking at photos of family members. Providing a quiet room where the person can rest during the celebration is helpful, too, she says. For Mary and Terry, taking some of the pressure off has made Christmas more bearable, but they can't shake the sense of loss that comes with it. "For me the hard part is that my mother-in-law is still with us physically, but mentally she's not there," Mary says. "It's almost like having somebody that's a stranger at Christmas." Helen spends hours a day working on word searches. 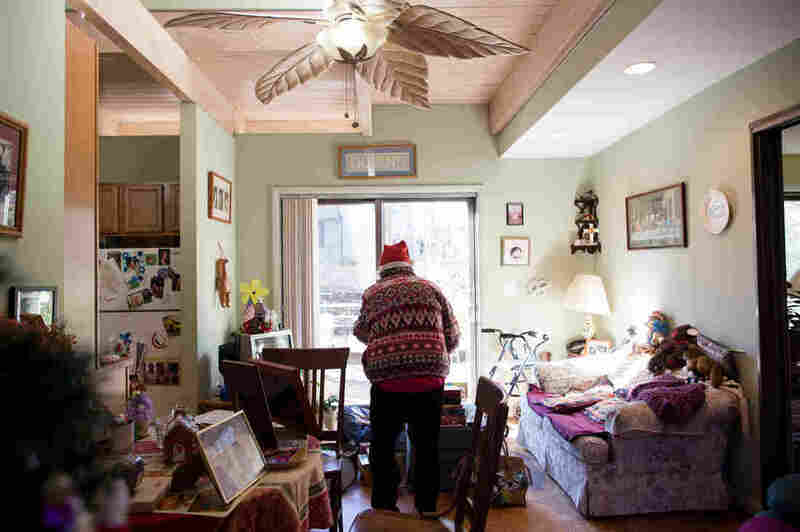 In her specially designed apartment, shelves are open so she can find what she needs. Knobs have been taken off the stove to prevent accidents. Last year they took what felt like a radical step — they left. With Helen in good hands, they flew to Hawaii to spend Christmas at the beach. This year they'll be at home, but that's all they've decided. Maybe they won't celebrate at all. But Terry will put up a tree in the small apartment he and Mary built onto their house for Helen. She's sitting at a table, 25 puzzle pieces spread out in front of her, when Mary brings out a box full of ornaments. "Helen, Christmas is coming up soon," Mary says. "What do you want for Christmas?" When Mary asked Helen what she wants for Christmas, Helen said: "All I ask is to be in good spirits and in good health so I can come and show myself off when we have the party." Helen looks up from her puzzle. "All I ask is to be in good spirits and in good health so I can come and show myself off when we have the party." Mary raises her eyebrows and glances at Terry. "You want to have a Christmas party this year?"